Instruments that were once bulky are now increasingly miniaturised and this is giving rise to sensors that can gauge shapes in real-time. Key players include: Infineon Technologies AG, Cognex Corporation, LMI Technologies, Occipital Inc., Panasonic Corporation, SICK AG, Sony Corporation and XYZ Interactive. Rapid technological advancements are also opening up a plethora of new applications across different industry verticals where these sensors can be used. However, one recognised growth impediment is a shortage of technology expertise in the field of 3D sensors positioning and fixation. To overcome this shortage, companies are now creating partnerships and increasing their collaborative efforts. In January, ams AG the Austrian headquartered supplier of high performance sensor solutions, entered into an agreement with Face++ a leader in artificial intelligence software, to accelerate OEMs’ and system integrators’ deployments of 3D optical sensing technologies such as face recognition, facial payments, Animoji creation and augmented/virtual reality. The 3D optical sensing solutions created by ams and Face++ use infrared light projectors to map the surface of real-world objects. Ulrich Huewels, Executive Vice-President & General Manager for Optical Sensor Solutions at ams said, “By linking our 3D sensing systems with Face++ technology, we are enabling manufacturers to add these popular features to their products quickly and smoothly…3D sensing solutions are ready for the mainstream now in every market sector, from consumer to automotive, medical and industrial electronics.” ams’ collaboration with Face++ follows its collaboration with Qualcomm Technologies, Inc., announced last November, for the joint development of face recognition technology for mobile phones. The development is based on ams IR illuminator modules and Qualcomm mobile application processors. Other recent developments include: PMD Technologies AG and Ningbo Sunny Opotech collaboration to strengthen their existing partnership. The partners will develop and market 3D sensing camera solutions for mobile devices to OEMs in China and the rest of the world. PMD Technologies AG has also launched a new 3D imager IRS238XC. Meanwhile, Qualcomm Technologies, Inc., and Himax Technologies, Inc. recently launched a collaboration to accelerate the development and commercialisation of a high resolution, low power active 3D depth-sensing camera system. Also in January, Panasonic’s first-to-market solution, Visual Sort Assist (VSA), made its debut at ‘NRF 2019’. The VSA is semi-automation software that achieves what is described as “dynamic sortation” in manual facilities. Combining barcode scanning, projection and 3D sensor technology, VSA detects and tracks parcels throughout a facility and supports streamlined sortation, delivering dramatic cost reductions in package routing and increased throughput. In other developments, Munich-based Osram Opto Semiconductors GmbH has set new standards in the 3D sensing market with the launch in late January of two new Vertical Cavity Surface Emitting Laser (VCSEL) products. VCSELs combine the high power density and simple packaging of an infrared LED (IRED) with the spectral width and speed of lasers. The two products, the PLPVCQ 850 and the PLPVCQ 940, will be available in the first half of 2019. 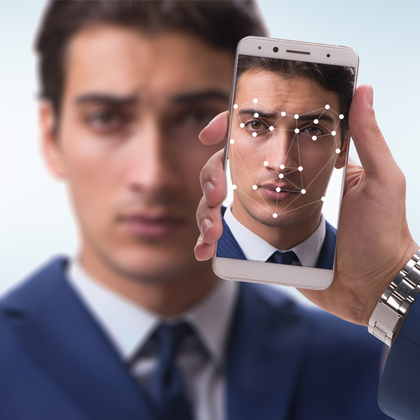 One of the most popular application fields for VCSEL technology is face recognition for smartphones. Nina Reiser, Marketing Manager at Osram Opto Semiconductors explained, “One application of the new VCSEL is the so-called Object or Architectural Scanning in addition to Machine Vision or Face Recognition. This allows the 3D image of a room to be created and virtual furniture to be used in it. When setting up the living room, for example, you can test whether the design of the newly selected couch harmonises with the room or whether it is too big for it.” The VCSEL illuminates the face with the camera’s infrared light. The recorded image is then compared with the image stored in the system and released if the screen matches. So the indications are clear. Growing demand for 3D Sensors in consumer electronics is a key driver of the market. And while North America is the current market leader China and indeed all Asia is growing rapidly. As a consequence, greater collaboration between US/European and Chinese companies can be expected.